Multilingual medical assistant Kaissa Oulhadj worked at work at Boston Medical Center. Banks and cellphone providers are hiring employees who can communicate with potential customers in their native tongues. Software firms are seeking out translators and customer service representatives who can help them build their business around the world. And health care providers looking to serve the immigrants in their communities, as well as patients traveling to the United States for medical care, are beefing up their staffs with people who can understand, and convey, their concerns. The number of online job postings targeting bilingual workers more than doubled nationwide between 2010 and 2015, rising 162 percent, according to a new report by New American Economy, a coalition of mayors and business leaders that supports immigration reform. The languages seeing the biggest rise in demand: Chinese, Spanish, and Arabic. Bilingual job listings for higher-end positions, including those in finance and engineering, grew the fastest, but the majority of bilingual jobs didn’t require a bachelor’s degree, including medical assistants and customer service representatives. 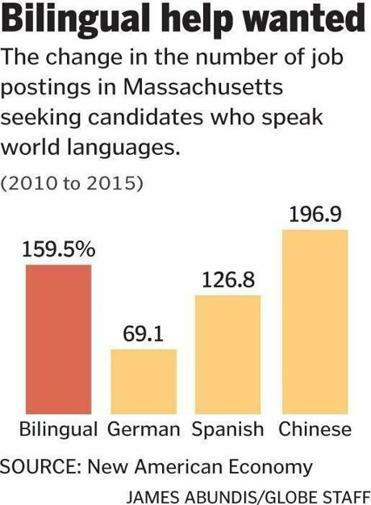 In Massachusetts, online job listings for bilingual workers increased by 160 percent between 2010 and 2015, with Chinese, Spanish, and German skills showing the largest rise, according to the study. Teaching, health care, and insurance jobs accounted for many of the positions posted for Chinese and Spanish speakers, while pharmaceutical and electronics companies that have a strong presence in Europe drove the demand for German. Ivy Pretto, a 34-year-old native of Peru who moved to Boston with her family when she was 2, has used her Spanish skills throughout her career in real estate and mortgage lending. After taking some time off to travel last year, Pretto had several companies pursuing her when she returned to Boston. She ended up taking a job as director of customer experience for the mortgage tech startup RateGravity, which is looking to hire more bilingual customer service agents and software engineers as it taps into underserved markets. Jose Diaz is one of many bilingual DiLuigi Food workers. The share of jobs seeking dual-language speakers is relatively small, just 2.3 percent of all online listings in 2015. But that’s up from 1.9 percent in 2010. During that time, employers added jobs for bilingual workers at a faster pace than for workers overall. In some cases, reaching out to immigrant communities is the only way for a business to grow, said Annalisa Nash Fernandez, a New York-based intercultural strategist who advises companies about bilingual employees. And with one in five Americans speaking a language other than English at home, up from one in nine in 1980, the number of people growing up fluent in multiple languages is rising. And this is who employers want, Nash Fernandez said — not people taking Spanish classes at night. “There’s enough now of these first-generation Americans and second-generation immigrants that are perfectly bilingual, and it’s hard to compete against that,” she said. The employer leading the way in bilingual job listings, both nationally and in Massachusetts, was Bank of America, which posted positions seeking dual-language speakers in more than a third of its online job listings around the country in 2015. 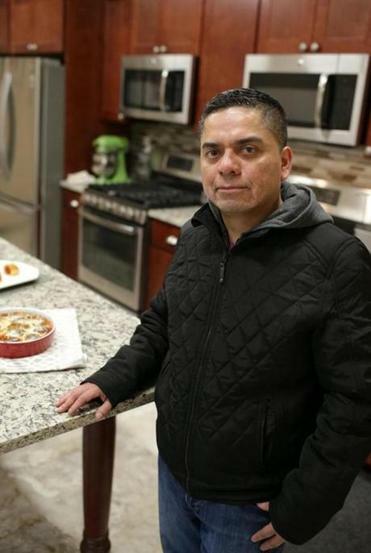 Many banks have been reaching out to immigrants, who are less likely to have bank accounts or use banks regularly than American-born residents, according to the New American Economy report. Some time in the 2040s or 2050s, according to projections, the United States will become a majority-minority country. While President Trump’s crackdown on immigration has made the United States a less welcoming place for refugees and other foreigners, if the flow of immigrants slows, the size of the American workforce could shrink. An estimated 38.5 million immigrants of working age will be in the United States by 2035, up from 33.9 million in 2015, according to Pew Research Center. But without those new arrivals, the country’s working-age population would fall. 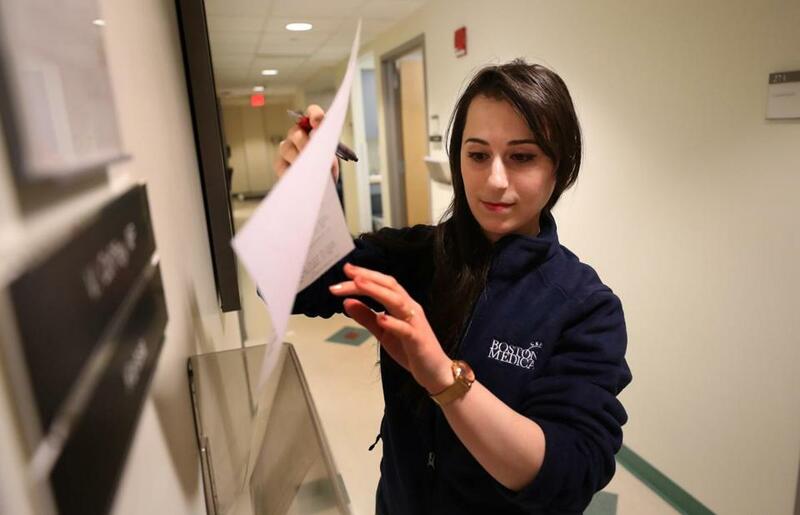 When Kaissa Oulhadj interviewed for a medical assistant job at Boston Medical Center last year, the first question she remembers getting was: “How many languages do you speak?” Oulhadj, a 27-year-old from Algeria who speaks Berber, Arabic, French, and English, understands Farsi, and is learning Spanish, said it’s not unusual to use four or five of her languages in a single day. “It’s very tiring sometimes,” she acknowledged. Oulhadj is one of 315 bi- or multilingual employees hired for Boston Medical Center’s outpatient clinics since January 2016, making up more than 40 percent of outpatient hires. The center has long served the area’s immigrant communities, but the need for employees who can speak multiple languages has increased as the hospital seeks to improve the patient experience, said chief human resources officer Lisa Kelly-Crosswell. 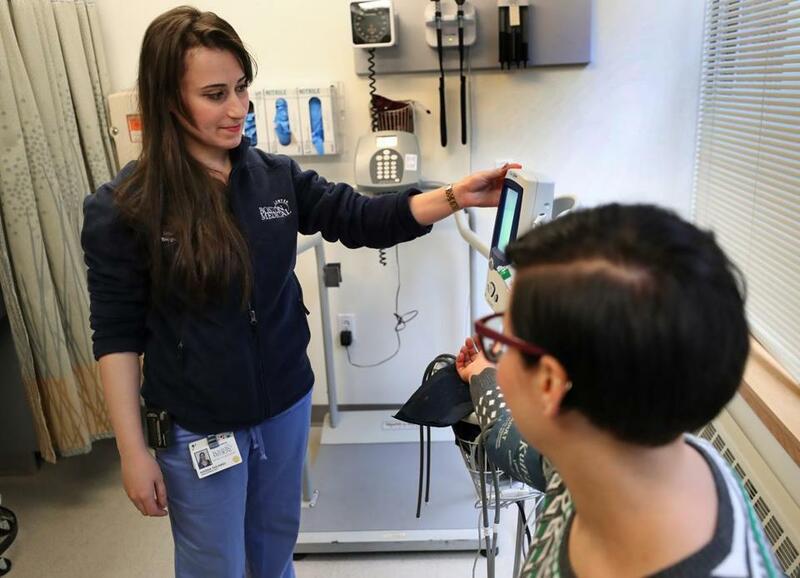 People coming to Boston’s world-famous hospitals from other countries are also driving the need for multilingual employees, said Maria Vertkin, whose nonprofit, Found in Translation, trains low-income immigrants to become medical interpreters. Some employers who once hired immigrants almost exclusively for entry-level jobs are now more able to hire bilingual supervisors to bridge the language gap. About half of the 250-person staff at DiLuigi Foods, a meat-processing company in Danvers, speak only Spanish, according to president Dean Souza. In the past, English speaking managers and trainers largely relied on workers to translate for them, but in recent years, more bilingual supervisors have been filling those roles. “It’s not like they’re just on the bottom layer anymore,” Souza said. Sometimes, though, too much exposure to American culture can be a bad thing. FreeLogoServices.com, a Boston-based online logo maker, has customers in 120 countries and translates its website into 10 languages, and continues to grow around the world. To ensure that the website’s language is accurate and culturally up to date, the company requires its translators to have grown up in the country whose language they speak; if they live in the United States, they can’t have been here for more than six years. Multilingual medical assistant Kaissa Oulhadj worked with a patient at Boston Medical Center. Trump wants faster growth. The Fed isn’t so sure.